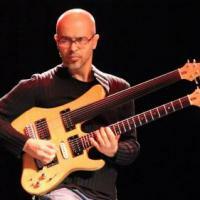 Timucin Sahin Trio on Out To Lunch: Friday, April 25th at noon. Tune in Friday at noon for an exciting live set by composer/guitarist Timucin Sahin. The trio will feature Matt Brewer on bass and Gene Jackson on drums. The live set will be followed by an interview of the trio. Read more for Timucin Sahin's bio. Timucin Sahin has been recognized as one of today’s truly unique voices of contemporary jazz music. His unique sound on fretless electric guitar and his emotional content in his composing made him non-comparable and his music almost impossible to categorize. Both his compositions and his playing on his double-neck guitar – his trademark – radiate an incomparable individualism. His music is drawn from a wide body of knowledge and experience, often developed from his considerable skills as a guitarist. He employs improvisation but in ways hard to separate from the sound of his notated music. His music is characterized by a delicacy of instrumental imagination and rhythmic structures, which have much flexibility though clearly pulse derived. He recently released his quintet album "Inherence" which is reviewed by Downbeat as "very impressive, visceral yet also cerebral and feisty quintet album".